There are 5 ways lightning can strike a person. And each one can be deadly. If you hear thunder, you are close enough to the storm to be struck by lightning. Take cover immediately. Below is a breakdown of the 5 ways from the National Weather Service. Direct Strike: A person struck directly by lightning becomes a part of the main lightning discharge channel. Most often, direct strikes occur to victims who are in open areas. Direct strikes are not as common as the other ways people are struck by lightning, but they are potentially the most deadly. In most direct strikes, a portion of the current moves along and just over the skin surface (called flashover) and a portion of the current moves through the body--usually through the cardiovascular and/or nervous systems. The heat produced when lightning moves over the skin can produce burns, but the current moving through the body is of greatest concern. While the ability to survive any lightning strike is related to immediate medical attention, the amount of current moving through the body is also a factor. Side Flash: A side flash (also called a side splash) occurs when lightning strikes a taller object near the victim and a portion of the current jumps from taller object to the victim. In essence, the person acts as a "short circuit" for some of energy in the lightning discharge. Side flashes generally occur when the victim is within a foot or two of the object that is struck. Most often, side flash victims have taken shelter under a tree to avoid rain or hail. Ground Current: When lightning strikes a tree or other object, much of the energy travels outward from the strike in and along the ground surface. This is known as the ground current. Anyone outside near a lightning strike is potentially a victim of ground current. In addition, ground current can travels in garage floors with conductive materials. Because the ground current affects a much larger area than the other causes of lightning casualties, the ground current causes the most lightning deaths and injuries. Ground current also kills many farm animals. 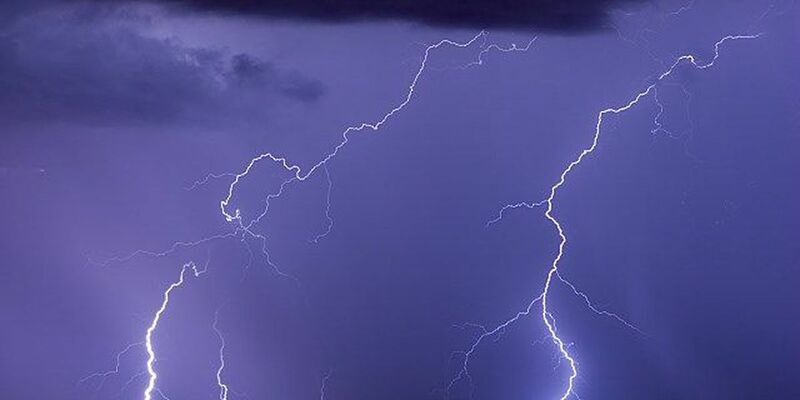 Typically, the lightning enters the body at the contact point closest to the lightning strike, travels through the cardiovascular and/or nervous systems, and exits the body at the contact point farthest from the lightning. The greater the distance between contact points, the greater the potential for death or serious injury. Because large farm animals have a relatively large body-span, ground current from a nearby lightning strike is often fatal to livestock. Conduction: Lightning can travel long distances in wires or other metal surfaces. Metal does not attract lightning, but it provides a path for the lightning to follow. Most indoor lightning casualties and some outdoor casualties are due to conduction. Whether inside or outside, anyone in contact with anything connected to metal wires, plumbing, or metal surfaces that extend outside is at risk. This includes anything that plugs into an electrical outlet, water faucets and showers, corded phones, and windows and doors. Streamers: While not as common as the other types of lightning injuries, people caught in "streamers" are at risk of being killed or injured by lightning. Streamers develop as the downward-moving leader approaches the ground. Typically, only one of the streamers makes contact with the leader as it approaches the ground and provides the path for the bright return stroke; however, when the main channel discharges, so do all the other streamers in the area. If a person is part of one of these streamers, they could be killed or injured during the streamer discharge even though the lightning channel was not completed between the cloud and the upward streamer. See Robert's story as an example of a streamer injury.